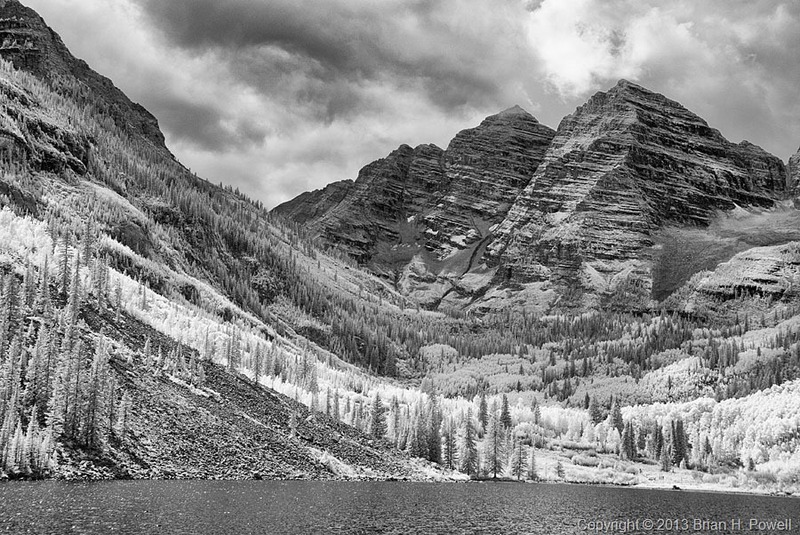 This past week, I had a chance to go up to Aspen, Colorado, and visit the Maroon Bells Recreation Area in the White River National Forest. There had been rain all over Colorado—major flooding near Boulder, Lyons, and Estes Park—so, I stayed further south and west by visiting Aspen. There was a mix of sun and clouds as I started hiking past Maroon Lake. The Aspen trees are just beginning to turn to their bright yellow fall colors, and soon, this area will be inundated with photographers. I was told it is the most photographed spot in Colorado. Always wanting to do something a little bit different, I used my infrared camera (a Nikon D200, converted by LifePixel) to capture the image below. By the end of my hike, the storm clouds had started to surround the peaks, light rain and thunder started, and I made it back to my car just in time. It was a great hike.